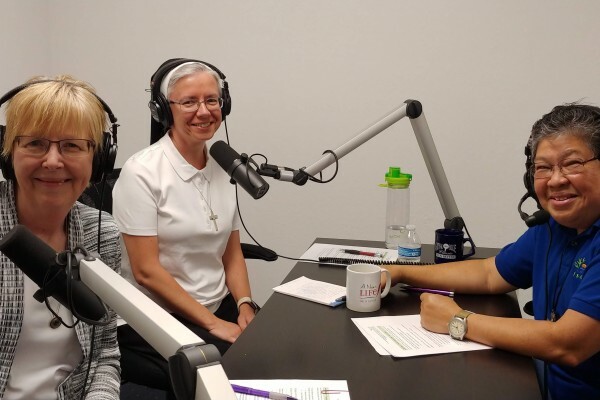 Sr. Angela Szczawinska, CSFN, was recently interviewed for “Ask Sister,” a podcast produced by A Nun’s Life Ministry. During the interview, Sr. Angela, along with Sr. Maria Brizuela, OSF, talk about the challenges, rewards and sacrifices of religious life. Jokingly, she went on to explain, “I didn’t really want to be a sister. So for me, when something happens and [religious] life is not easy to deal with… I tell God, ‘OK you just fix it…. You want to keep me here? Make it work… You fix it.’” That continuous surrender to God’s plan has been working well for Sr. Angela during her 29 years in religious life. Sr. Angela entered the Sisters of the Holy Family of Nazareth in 1989 and currently serves as the Province’s Electronic Media Coordinator.